Cherie Lee, 37, realized she wanted to change careers while she was volunteering in the wake of Hurricane Michael. The experience was so rewarding that Lee, who was working for the Florida Department of Revenue, applied for and accepted a position with the Federal Emergency Management Agency. “I just really want to help people. My dad says it’s my downfall,” Lee said. She quit her job and prepared to start at FEMA on Dec. 27. But just days before, the federal government shutdown began. FEMA is one of the government agencies that is funded during the partial shutdown, but the employees who need to approve Lee’s paperwork were affected, and she hasn’t been able to start the new job. Left in limbo with no income, Lee has been cleaning houses, pulling weeds and doing other odd jobs to make ends meet until the shutdown ends and she can start in her new FEMA role. About 380,000 government workers have been furloughed since the shutdown began Dec. 22. Another 420,000, including TSA agents, are being forced to work without pay. If the government is not reopened in the next few days, furloughed government workers will miss two regularly scheduled paychecks. The strain on current and future federal workers like Lee is may be damaging the government’s reputation as a stable employer, which could hurt its ability to recruit younger workers at a time when federal agencies need to replace thousands of baby boomers hitting retirement age, experts say. Nearly a quarter of the federal workforce is older than 55. Only 17 percent of federal workers are younger than 35, compared to 40 percent in the private sector. 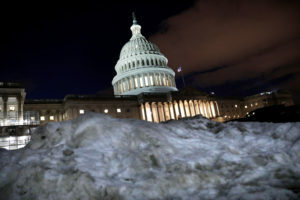 As potential employees decide whether to apply for government jobs, Paul Light, a professor of public service at New York University, said the shutdown is sending a clear message. Light said many young people, including those he teaches, want to make a difference in the world coming out of college, and are ripe for recruitment to public service. But now they could be rethinking their options. Several science students considering jobs at federal agencies such as the National Science Foundation told The Verge that the shutdown was causing them to rethink their career paths. The shutdown’s impact on federal hiring is also being felt at the highest levels of government. Kevin Hassett, the chair of the White House Council of Economic Advisers, told The New York Times this week that a graduate student told the council he might not take the federal job he was offered because the government could not bring him onto the payroll. Government agencies have for years reported difficulty in hiring. A 2015 study by Accenture found that 64 percent of public sector leaders across the nation said they had trouble attracting and retaining new talent. Morale is also low in government agencies, an issue that predates the shutdown. According to Partnership for Public Service and Boston Consulting Group’s annual “Best Places to Work in the Federal Government” rankings, 59 percent of federal employees said they were less engaged at work in 2018 than the year before. The shutdown could exacerbate those problems. Human resources departments at federal agencies will face a backlog in hiring once the government reopens, and there could be an uptick in current workers who retire or quit. In a survey of 1,940 government workers affected by the shutdown who are using ZipRecruiter to look for work, 67 percent said the shutdown has made them consider leaving government employment to seek work in the private sector. Of those looking for work, 89 percent said the shutdown was causing them a significant financial hardship, and 48 percent were pessimistic that the shutdown would end within the next 30 days. The longer the shutdown goes on, the more likely it is that people considering a government career–and those already in one–might start looking elsewhere. With 2.1 million employees, the federal government is the largest employer in the nation, and 85 percent of the workforce lives outside of Washington, D.C. A host of other jobs, including 7 million government contractors, rely on federal agencies. While conservative groups often advocate for smaller government, experts say shrinking the federal workforce should be a thought-out strategy, not a byproduct of a shutdown, because the tasks it performs are essential to everyday life, including food inspection, air traffic control, disease prevention and national security. “If we don’t have great talent, we won’t have a government that allows us to compete globally and maintain our status as the economic leader of the world. We won’t be able to live with the assurance of safety that we currently enjoy,” said Max Stier, the president and CEO of Partnership for Public Service — a nonprofit that advocates for a more effective government. Despite the shutdown, working in the public sector still brings certain advantages, and some people entering the job market or seeking new work likely won’t be deterred from applying for work with the federal government. The average federal worker receives more in wages and benefits than those in the private sector. That holds true for every education level except for workers with doctorate degrees. Government employees are also much less likely to be laid off than people in the private sector. In 2016 and 2017, about 5.6 percent of federal workers were laid off, compared to 15.6 percent in the private sector. Troutman said she has not seen a decline in the number of people asking for her help applying for government jobs. As for Lee, the woman recently hired by FEMA, she said she would recommend that others who are considering federal government work look at all their options before committing. That includes jobs at the state level or at nonprofits, Lee said. But Lee is determined to wait out the shutdown and start her new job. She said she had a simple message for lawmakers.